Common sense is a parent’s best medical tool when evaluating the health and wellbeing of children. With some scientific knowledge, your common sense can become more accurate. So, let’s examine some facts, and basic insight about a common pediatric malady, Pes Planus - "flatfoot disorder". There are many contributors to this condition and many problems caused by this condition. Therefore, this condition must be recognized early and steps taken towards treatment. The worst expectation is that "the child will grow out of it" - in most cases this is not true and the condition will worsen if not treated. Normally, children are born without an arch, which develops over the first ten years of life. 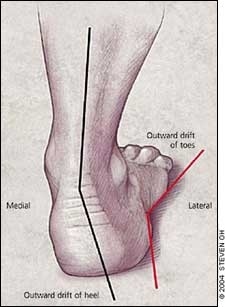 It’s important to point out that "flatfoot" deformity takes many forms, and that the lack of an arch, is just one manifestation of this condition (usually the mildest). Developmental norms occur at known points in a child’s growth, and are important to understand. 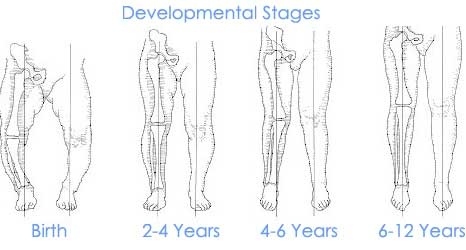 Children are normally born "Bow Legged" and then "Knock knees" are normal at certain points of growth. Acknowledging these stages is important because as the angles at the knee change, so do forces on the foot. When evaluating a child, these changes must be considered. Most children are very flexible, which allows them to adapt to these changes without issue. But, occasionally, these adaptations lead to abnormal function within the extremity. During development, issues may be caused by other malformations, such as improper spine curvature or one leg slightly longer than the other. Another consideration is your child’s body mass. Simply put, the heavier your child, the greater risk of adversely affecting the foot’s function. This is just as important if not more, than other factors, and, when associated with poor biomechanics, can quickly perpetuate the problem. The pain, discomfort, and fatigue caused by these issues, can alter the child’s fitness. Flatfoot commonly presents with the child bearing weight on the inside of the foot, best noted by observing stance from behind. The heels appear to be tilted outward. Also, "knock knees", and/or an outward pointing of the feet are noted. There may be complaints of pain or discomfort in the feet, knees, hips, or back, and complaints of rapid fatigue while performing activities. Here, your parental common sense factors in. Observe his/her normal activities, and if they appear to be struggling or "just not right", there is likely a problem (especially if not progressing as mentioned). At this point the child should be assessed by a specialist. Usually, these issues are treated successfully with shoe gear changes, strength training, custom inserts, and basic education. If the problem worsens or persists, surgery may be required to restore proper function and prevent further injury. Remember, the sooner the issue is addressed, the less chance that more invasive treatment is needed, and the child can experience activities appropriately and pain free, preventing development into adult issues! When it comes to your child’s health, trust your common sense.